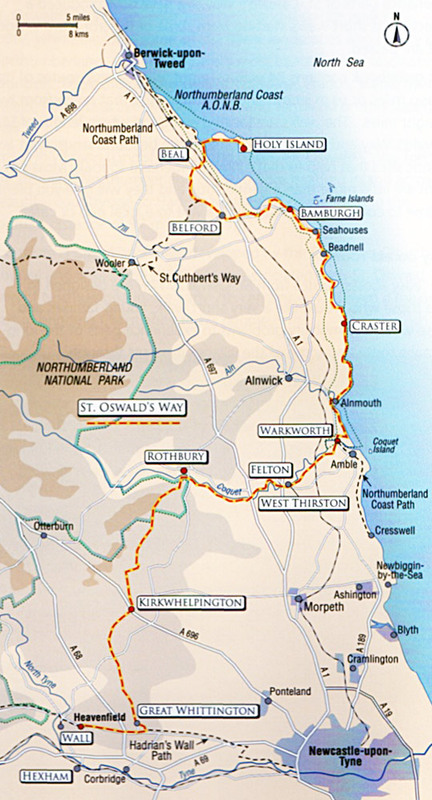 St. Oswald’s Way explores some of the finest landscapes and fascinating history of Northumberland. It links some of the places associated with St. Oswald, the King of Northumbria in the early 7th Century, who played a major part in bringing Christianity to his people. For those of you who may not have the time though to tackle a whole section, or indeed the whole walk, we have created a variety of short walks, to make it easy to enjoy St. Oswald’s Way whatever your circumstances. All 24 of these walks can be found in our Short Walks Around St Oswald’s Way Guidebook, and we have also produced three packs of eight walks maps, divided into Coast, Country and Easy Access routes. These lovely walks will find you in amongst castles, coastline, islands, scenic river valleys, hills, attractive villages, forest and farmland on your walk. The guidebook and packs include maps, route instructions and information about the places and features found on the walk. Coast – walks that help you explore the beautiful Northumbrian coastline and it’s villages, castles and magnificent beaches. Country – these short walks will ensure you see the some of the best countryside Northumberland has to offer with it’s rolling countryside, spectacular woodland and variety of wildlife. Easy Access – very short walks for young families, the less mobile or those who just want an easy stroll on a Sunday afternoon. Choose these walks for the simplest way to explore parts of St. Oswald’s Way.